This post is (again) about my water system. And to be honest, nothing has really changed, but I am just so happy with this system that I want to talk about it a little more. (Really, I cannot tell you how happy I am with this entire system, from the way I collect the water, to the way I treat the water, store the water, and drink the water. For me, this just works. This is a total of 3.1 oz for my water purification system. Notice I said purification system, not filtration system. This is because the tablets will kill all the viruses and small bacteria in the collected water within 20 – 30 minutes. For the larger baddies (Crypto & Giardia) a wait time of 4 hours is recommended, however, this is where the Frontier Pro Filter comes into play! After dropping in a MP1 tab and then waiting up to 30 minutes, the water can then be filtered through the Frontier Pro filter which will eliminate those big baddies. After this is said and done, the water is purified, meaning no viruses and no bacteria! (Which is more than those “filters” will accomplish.) Also, I typically carry the tabs in a Ziploc baggie just to keep up with them which adds about an extra 0.2 oz. But, this is just part of my water system. With the above listed items I can prepare untreated water to be ready to drink, but then I gotta drink it outta something… this is where a $1 Gatorade bottle comes into play. I have bought those expensive Nalgene bottles and numerous other marketed water containers, but I enjoy using a plain ole’ Gatorade bottle best. Why you ask? Price: At about $1 each, they are way cheaper than those other containers. Availability: Walk into almost any convenient/grocery store and there they are. Disposable: These last a while, but thanks to # 1 & 2 it’s ok if they don’t. Wide Mouth: Not quite Nalgene wide, but wider than soda bottle mouths. Light Weight: At ~ 1.3 oz/bottle, they are far lighter than many other containers. Clear: The see-through bottle allows me to keep up with how much I have/drank. Prefilled: That’s right, this baby comes filled to the top! So, as you can see, I have a few reasons to like the Gatorade bottles. Even though I used to think it was silly when the “cooler” Nalgene type bottles were available (besides, we all know that a “real” hiker carried a Nalgene type bottle). ULA probably played a large part in converting me to both chemical treatment as well as using Gatorade bottles. 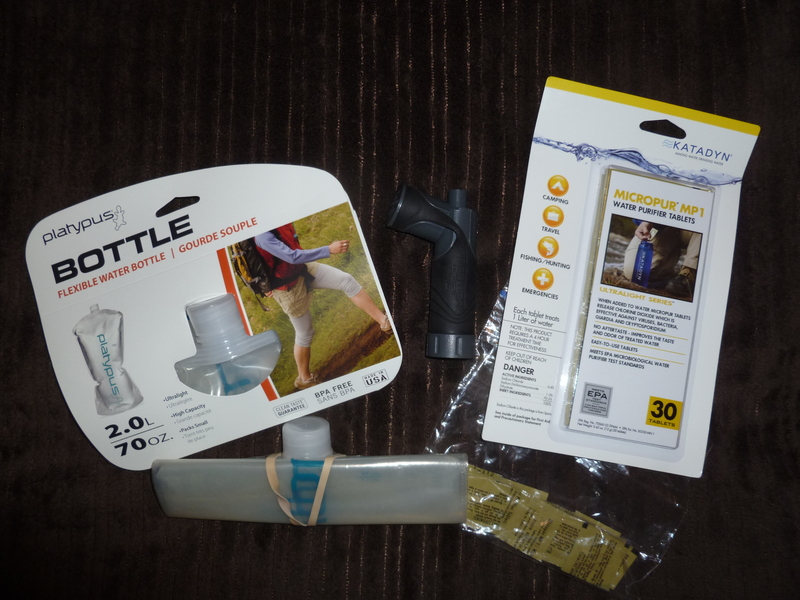 In the beginning, I used a Camelbak 100 oz bladder with a Katadyn Hiker Pro Water Filter, and I gotta say, I hated fooling with the hoses and trying to balance in awkward places/positions. But once my ULA Circuit arrived, that changed! The Circuit had water bottle holders on the shoulder straps, and I was looking forward to giving them a try. As seen in the picture above, the ULA water bottle holder is on top. 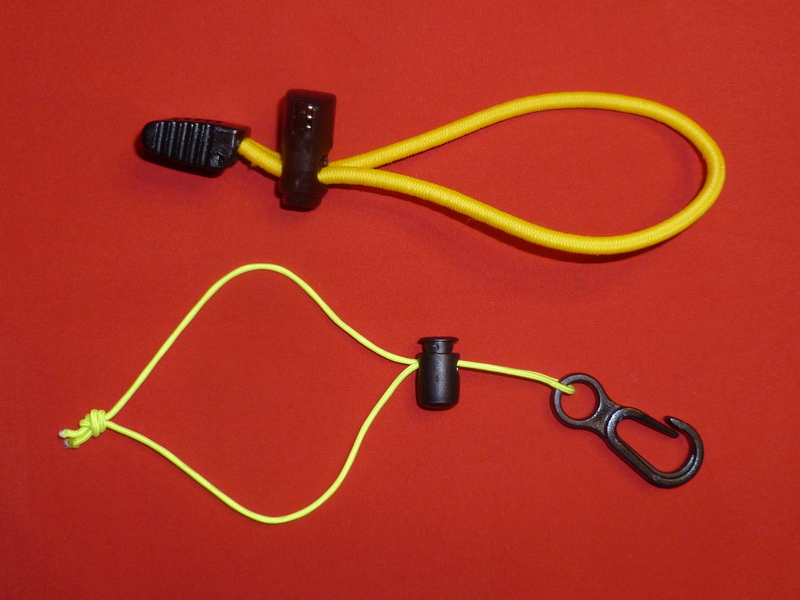 It is simply a yellow elastic cord with a cord lock and a clamp on the end. To operate it, one simply slips the water bottle in the shock cord and then cinches the cord lock tight against the bottle. Simple, ain’t it? When I got home from our Scout meeting I pulled out the extra Spectra cord that came with my ZPacks Hexamid tent, some tiny cord locks and a mitten hook (both of which was also purchased from Joe at ZPacks). Constructing the new water bottle holder was quite simple. I cut the cord approximately 7″ long. I slid the mitten hook on the line and then doubled it over. I then pushed the cord lock over the 2 ends and up towards the mitten hook. (Now the mitten hook was secured on the cord.) Lastly, I simply tied the 2 ends of the cord together. Operating the new water bottle holder is rather simple. As can be seen in the photo above, simply put the loop over the mouth of the bottle and then cinch it tight under the lip with the cord lock. The water bottle is now secured to the water bottle holder. Next, I attached the mitten hook directly to the daisy chain on my backpacks shoulder strap. Finally I insert the bottom of the bottle through the ULA water bottle holder and cinch the cord lock snug. The top water bottle holder actually holds all of the weight whereas the bottom water bottle holder simply keeps the bottle stationary. In my use so far, this has worked quite beautifully. The mitten hook attaches easily enough to the daisy chain, although if I am wearing gloves, removing them makes is sooooo much easier. Over time the cord lock would work its way back a little, but never enough for the water bottle to fall through. On occasion I would simply check the position of the cord lock and re-tighten if needed. I could have simply tied another knot in the cord to hold the loop securely around the mouth of the bottle, however, since I used the cord lock I can easily remove the bottle without cutting the cord. So, the cord lock makes it reusable. I start off with a brand new, filled Gatorade bottle. Before leaving I will fill the Plat with 1L of water (out of the tap so it does not need to be treated). As I hike I drink from the 32 oz Gatorade bottle. Once it is empty I replace the water in the Gatorade bottle with the water from my Platy. At this point I begin to think about refilling the Platy bottle, however, this all depends on how fast I am drinking as well as how often I am coming across water. If I choose to refill the Platy when the Gatorade bottle is still full I will only get 1L and drop a tab in. If the Gatorade bottle is closer to empty I will get 2. Using this method I only carry the water I need, and no extra. So, in the end, this is what I am very happy with. If you happen to meet me on the trail and ask me for clean water, this is how I will serve it up! And just as the title suggest, I will probably add in some grape Kool-Aid to give it a little flavor…Yum! Thanks everyone for your time. I hope you enjoyed it, and maybe encouraged you a little to find that “perfect” system that works for you (if you haven’t already). This entry was posted in DIY/MYOG, Gear, The Trail, Water Stuff and tagged Aqua Mira, Backpacking, Blast 30 Backpack, camping, Cord Locks, Crypto, Flexible Bottle, Frontier Pro, Gatorade Bottle, Giardia, Grape Kool-Aid, Hexamid Tent, Hiking, Katadyn, Katadyn Hiker Pro, McNett, Micropur, Mitten Hooks, MP1 Tablets, Nalgene, Platy Plus Bottle, Platypus, Purification Tablets, Soft Bottle, ULA Circuit, Water Bottle Holders, Water Filter, water filtration, water purification, ZPacks. Bookmark the permalink. 16 Responses to I Put Kool-Aid In That!! Great job…nice incorporating so much DIY…thanks for sharing it with me. Have similar setup.. though I use drops. Works great! I’ve begun using tablets to purify my water (I also used to use a Hiker Pro), but I’m struggling to find a prefilter that I can be happy with. My goal is to filter out sediment and debris, as opposed to killing any real germs. I’ve seen a lot of stuff online (mostly on BPL), and I’ve tried quite a bit of it–using a coffee filter, using a camp towel, etc. I’ve looked into the Frontier Pro, and it seems like something that I could be happy with b/c it seems so easy to use (even though it’s not as light as some other prefilter options). One thing I’m not sure of is if you can speed up the filtering process by squeezing the dirty bag (Platy in your case) or if it’s better to let gravity do the work. How do you use your filter? And how long does it take to filter a liter of water? I’ve begun using tablets to purify my water, but I’m still looking for a suitable pre-filter to get out sediment and debris. I’ve seen plenty of stuff on BPL discussing coffee filters (way too slow), camp towels, etc., but I have yet to find anything that I’m happy with. I’m interested in the Frontier Pro because it’s seems so easy to use and will actually help purify the water, but I’ve still got a couple of questions about the filter. When you’re transferring water from the Platy to your Gatorade bottle and using the Frontier Pro, do you squeeze the Platy to speed up the process, or do you just let gravity do the work? How long does it take you to filter a liter of water from the Platy to the Gatorade bottle? I wouldn’t classify the Frontier Pro as a “PreFilter” since it is in fact a true “filter.” Granted it will not filter down to the same micron size as a Hiker Pro Filter (which is not what the FP filter was created for regardless) but the FP filter will indeed remove harmful and threatening bacteria down to 3 micron. Keep in mind though, the FP filter is not intended to be a stand-alone filter, but rather to work along side chemicals as a complete unit. Also, the FP is one of the lightest filters on the market today from what I have found. A prefilter, by my judgement, is simply something to strain out the large floaties, dirt, leaves, or simply put, debris, but provides no treatment or removal of threatening bacteria/viruses whatsoever from the water it is “filtering”. A prefilter is used to protect the actual filter and help to keep the actual filter from clogging so quickly. And, as you said, a coffee filter, bandana, camp towel, etc is such a thing. Some even use cotton balls. However, as I have mentioned, my entire set-up weighs in at ~ 3.3 oz which is lighter than any other method I know of other than either not carrying the filter (and carrying the tablets only) or simply carrying nothing and not treating my water. That 3.3 oz includes my tablets, the FP filter and my 2L Platy bag. Keep in mind too, that no matter which system I used, I would have the Platy with me, so if that were deducted, my total weight would then only be 2 oz. And those 2 oz will give me purified water, which a Hiker Pro (or other similar filter) will not give me. Anyway, I hope this helps some! Good luck in getting your kit together. Thanks for the response (and sorry about the double-post). I feel comfortable just using chemicals, but I want some sort of back-up–similar to how you’ve set up your system–in case the water looks questionable. I’m not worried so much about germs, because I have faith in the checmicals. I’m more worried about the floaties…I can’t bring myself to drink muddy water full of dead bugs, sticks, leaves, etc. As you said, it seems like a pretty great system for the weight. I may have to order the FP and give it a shot. If it’s only the floaties that you want to get rid of I wouldn’t buy an extra filter. I would just pour the water through a bandana or a camp towel or something as you are pouring it into your bottle to treat it. This will remove any floaties from the water. However, if you do want a back up, or a little extra “security” while treating skanky water, then it is a good back up to have, IMO. First off… your picture at Horse Gap brings back memories… My buddy and I stayed there the first night of our section hike back in November. I’m just curious on the purification side of things. I have been using Aquamira drops for purification and carrying the Frontier Pro for the same reasons you mentioned. I was just wondering if you have done any kind of comparison on drops vs. tablets. My wife and I spent our second night there on our first ever hike. We started at the Amicalola Falls Visitor Center and stayed on top of Springer the first night, then Horse gap the second night. 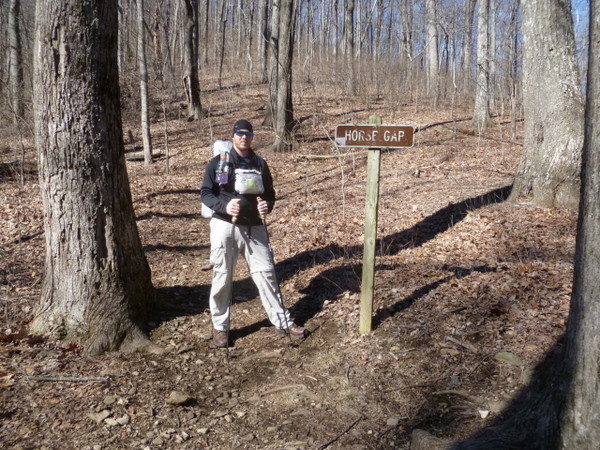 We also met the first hikers that we have kind of kept up with since here at Horse Gap. I will admit though, it was a little strange hiking through there again. I came across an interesting post over on BPL a while back that is obviously a letter written from the COO at AM which addresses the way that the ClO2 is released from the tablet form as well as the liquid form. He also addresses the issue/progress of getting AM registered as a purifier. Of course it is nothing “official” but it is a fun and interesting read. Recently I corresponded with Aquamira Technologies regarding their Aquamira tablets and drops. Product literature for the tablets indicated they generate 4 parts-per-million (ppm) of CLO2 in one liter of water. Based on label information, I calculated that Aquamira drops generate 5 ppm of CLO2 in one liter of water. This similarity in CLO2 ppm between tablets and drops conflicted with statements to the contrary that I had read over the past few years. I asked Aquamira Technologies if they could confirm the ppm concentration of chlorine dioxide (CLO2) generated by the two products. I also asked about the status of Aquamira drops’ approval as a water purifier. Please allow me to introduce myself; I am Dennis Brown the C.O.O. of Aquamira Technologies, Inc. I have received and reviewed your email of April 4, 2011 relating to some confusion in the market place and internet forums, regarding differences between Aquamira Water Treatment (liquid) and Aquamira Water Purifier Tablets. First, let me thank you for being a devoted user of our products and also let me thank you for your diligence in wading through the large amount of information available on the internet regarding our products in your effort to find answers to what can be somewhat complex questions. Basically you have come to the correct conclusion in your summary at the end of your email regarding the final concentrations of ClO2 in 1L of water using drops vs. tablets. There are a few things to consider that will add some light and understanding to the issue. The main difference between the tablets and the drops is the method of delivery of CLO2. In the case of the tablets, ClO2 is generated when the tablet comes in contact with water and it bubbles off as the tablet dissolves. This entire process happens within the container of water that is intended to be treated, so essentially the entire chemical reaction is contained in one container. It is true that when treated according to instructions, the result of the reaction is a 4ppm concentration of ClO2 in 1L of water. The delivery method of the liquid is much more complex and many factors may come into play that could have an effect on the final concentration of ClO2. 1. The reaction begins when the Part B (activator) is added to the Part A (2% stabilized chlorine dioxide). This process happens in a separate mixing cup. 2. The reason that the instructions call for a reaction wait time of 5 minutes is so that the mixture can be added to the water at the peak of ClO2 production. If a person adds the mixture too early or late, the final concentration of ClO2 in the water can be significantly less than the required 4ppm. 3. Since the reaction occurs in an “open-air” environment in the mixing cup, some CLO2 is lost to the atmosphere around the cup. This is evidenced by the “smell” when mixing the solution. Our mixing instructions have taken this into account which is why at first look the liquid concentration in the final container would calculate to be higher than 4ppm. Mixing in a windy area or at higher temperatures can add to this potential loss of ClO2. 4. Once the reaction time is reached, it is important to pour the entire amount of liquid in the mixing cup into the water to be treated. Any leftover material in the mixing cup essentially reduces the concentration of CLO2 in the final container. We recommend poring some of the treated water into the mixing cup and then pouring that back into the container of water to flush out any residual material from the mixing cup. If all of these requirements are met in the mixing and dispensing of the liquid ClO2 into the final container of water, the resultant concentration of ClO2 should be virtually identical to that of the tablets. This should address your question regarding the final concentrations of ClO2 in liquid and tablet treated water. Now allow me to address your other questions and concerns. Aquamira Water Treatment (liquid) has been in the marketplace for over 15 years. Aquamira purchases the base chemical from a bulk supplier. The primary EPA registration for this product was owned and controlled by the bulk chemical supplier. Over the years we have been limited to the label claims that were approved by the EPA for the base chemical supplier, and we had no ability to make changes to those claims. Recently Aquamira procured the EPA registration for the base chemical from the supplier and we are now in the process of submitting our own label with appropriate claims to the EPA. This is a lengthy process, and requires every claim to be backed up with test data. Some of the data was not available from the bulk supplier and must be supplied by Aquamira. We expect this process to take up to a year from now to complete. Since the initial claims from the bulk supplier for Aquamira Water Treatment were “bacteria, taste and odor”, and all testing was done in potable water, the required wait times are appropriately lower than the tablets. The testing for the tablets was conducted to meet the EPA purifier standards in EPA Type II water. This water is kept at low temps, has a high level of turbidity, and organic load to intentionally make chemical treatment more difficult. This is the reason for the 4 hour wait time with the tablets. Under EPA Type II conditions it takes 4 hours to achieve a >99.9% reduction of Cryptosporidium which is the most difficult test organism to kill. If Aquamira Water Treatment was subjected to the same conditions, it would require a 4 hour wait time to kill Crypto as well. Keep in mind that in very few cases would anyone encounter water sources that are even remotely close in difficulty to treat as EPA Type II water. Thank you again for the opportunity to address your questions and concerns. I extend my thanks to Dennis Brown and Aquamira Technologies, Inc. for their informative reply. Stick- I too like grape kool-aid, good stuff. Hmm, I wonder if both of us being from the South has anything to do with liking grape? What is the weight difference between both of the water bottle holders for the shoulder strap, and the zpacks shoulder pouch? So have you decided to use your Multipack for carrying items rather than bottles of water? Also, I like to use the 32 oz Gatorade bottles, which will not fit in the ZPacks shoulder pouch. And yea, I never wanted to use the Multipack for water bottles. I know that the weight of the bottles would offset the weight in the back more, but my bottle is still “technically” on the front side, albeit slightly off-center… But I like the Multipack for items that I need to get too that would have normally been kept in a hip belt pocket. So, has your ground sheet made it in? I am curious about how it will work with your tarp. Also, I am expecting the rain mitts tomorrow! Yea! I made a bottom water bottle holder using some thinner shock cord and a smaller cord lock than what the ULA water bottle holder was made from. Now, for both of the cords (top and bottom) the total weight is 4 grams on my scale, or 0.1 oz. Good system. I use a version of it myself. 2 bottles, Aqua Mira instead. No filter. My platy only for water scarce trips(last water source before camp). I’m gonna steal the mitten hook setup for my ULA CDT. I transitioned from Nalgenes to Gatorade bottles years ago. From there to Powerade(lighter) and the shape suited my Osprey Exos 46 better. Then I got turned onto Bolthouse bottles. Lighter and taller. Also work well with ULA setup. I was good with my AM drops only for a while, but the gear nut in me decided to give the FP filter a go. And to be honest, I am pretty glad I did. It is a little more assurance for me. And at only 1.6 oz, I feel it is justified. Feel free to steal the idea…like I said, it was nit mine to begin with. I watched tbhan55’s video and then noticed a version of it on my buddies pack. IMO, it really did make the ULA version better.